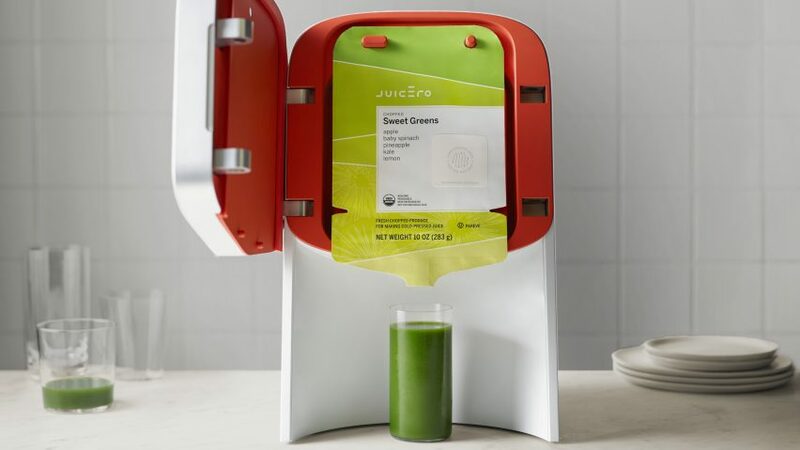 Yves Behar has spoken out about the widely ridiculed juicer he designed for Silicon Valley start-up Juicero, saying "people are very, very happy with it". The Juicero juicer became the subject of a social media backlash in April after it transpired that a pair of hands could do the same job as the $400 machine, which squeezed juice from pre-packaged sachets. In his first public comments on the controversy, Behar defended the product to Dezeen, saying that Juicero was a useful product. "I have a machine to grind my coffee," he said. "I don't grind my coffee with my fists. That would be a lot of work and make a lot of mess. I don't see a difference between the two situations." "The company is doing well, the people who have the product are actually very, very happy with it, and the reorder rate is actually very very strong." However, Behar stopped short of saying Juicero had been unfairly targeted by social-media commentators. "Sometimes you get into negative memes, sometimes you get into positive memes," he said. "I've seen it happen in other cases in the past. When the company is delivering a product and a service of quality that people love and respect and appreciate, those negative memes go away." "You have to have a long view of these things, and the internet tends to have a short view." Behar's studio Fuseproject had worked with Juicero for two years to design the Nespresso-style countertop machine, which was released in 2016 and currently retails for $399 (£310). It came to the attention of Twitter users following the publication of a Bloomberg Business article that said investors had been dismayed at the final product and included a video showing its juice packets being squeezed by hand. "The next time someone says Silicon Valley is going to solve hunger or climate change or take us to Mars, remember the Juicero," was the comment from one Twitter user, while another compared it to the "Juice-Loosener" from The Simpsons, which was sold with a lot of hype by the show's resident quack, Dr Nick Riviera. Since then, to be "the Juicero of" something has become a descriptor for other expensive gadgets of limited use – similar to how "the Uber of" is used as a shorthand for on-demand, app-based businesses. Ahead of its launch in 2016, Juicero had raised $120 million (£94 million) from high-profile investors including Google parent company Alphabet. The design by Behar – who is one of the world's leading industrial designers for new technologies – is considered to be one of the reasons for Juicero's relatively high price tag. It initially went to market with an even higher price tag of $700 (£550). Among its features is a door made of aircraft-grade aluminium. It is also Wi-Fi-enabled, for the purpose of rejecting out-of-date bags of juice based on scans of their QR codes. "Juicero is the first company to make cold-pressed juice something that people can make themselves at home," Behar told Dezeen at the time of Juicero's launch. "The challenges to design and engineer a press that can deliver 8,000 pounds of force are tremendous." "The goal was to balance the organic with the mechanical, with the exterior aluminium door showing both its quality and structural integrity." Behar's more recent designs include a sleep-aiding headband called Dreem and smart office furniture created with Herman Miller. He placed 26th among designers on Dezeen Hot List in 2016.